Count Basie put the right note in the right place at the right time, and that was some doing. William "Count" Basie was born early in the century in which his musical conceptions would prove to be so very influential. While he hadn't initially planned a career as a musician (more modestly looking towards a position within show business in general), he did exhibit natural talents at the piano and a heartfelt love of the blues. By the end of the '20s Basie was in Kansas City as a member of Bennie Moten's big band. On Moten's death in 1935, Basie became the leader of a reformed edition of that band, and one version or another of a Count Basie Band would be part of the musical landscape for the following almost 50 years. This documentary –- Count Basie -- Swingin' The Blues – initially broadcast in 1991 as part of the Masters of American Music series, downplays the strictly biographical elements of Basie's story in favor of providing context to his immense professional accomplishments. Basie played a key role in establishing the rhythm of the 20th century, an insistent propulsion which would flourish (in a different manner) in the century's second half. The mid-western city of Kansas City, Missouri was by all accounts, through the '20s and '30s, home to a vibrant music culture. A transportation and shipping hub, it was known as an "open town", where certain laws were just not enforced. Prohibition, for example, was effectively ignored, resulting in a dynamic night-life scene, with music, drinking, and dancing extending to dawn most every night. Basie is featured in the film recounting his introduction: "I got a chance to wander over on 18th Street, (which) at that time was blazing, I mean everything was happening and beautiful. You could hear the blues from any window or door." Basie himself became a master of tempo and that ineffable sense of "feel". While he could play the piano as a virtuoso, he preferred to create space within arrangements for others to find moments to contribute individually. His piano playing is thus described allusively: "He put the right note in the right place at the right time" or "he left out more than most people play". The choices made by the filmmakers, whether visual, aural, or both, highlight a precise articulation of time, place, and result which serves to match the qualities of its subject. The interview subjects – including luminaries such as Illinois Jacquet, Harry "Sweets" Edison, Jay McShann, and Joe Williams – can explain not only that something was good, but why it was good. The carefully selected music excerpts are artfully placed and complement the observations. Early in the program, as Basie's career is receiving an introduction, there is a wonderful sequence featuring a bisected bandstand and the original Basie band working through the signature piece "One-o-Clock Jump". By means of player choreography and editing, the relationships between the instruments within the arrangement are foregrounded, illustrating the interplay and mighty propulsion of the band as a whole, punctuated by the bopping heads of the musicians. The original Kansas City Basie orchestra was, to graft a not entirely appropriate analogy, like a dynastic championship sports team packed with young future hall-of-fame players, all together at the right place, right time, and with the right supporting personnel. The interview subjects consistently express an awe that they were not only in the band, but had a front row seat listening to their peers rip it up night after night. Basie's bemused smile was the visage of a good-natured man who enjoyed life and saw that those around him enjoyed it, too. The energy and easy laughter of the then old men gathered for the film's interviews is a fitting tribute to Basie's legacy: the infectious rhythm and joy contained in his music was the result of an understanding of human nature at odds with task-masters and ego kings. Says a later band member: "He was probably on the road sixty years, and all the situations and all the adversities and all the successes there, you won't find too many people with too many bad things to say about him. Now that's some doing." Near the end of the film, Jacquet sums up eloquently what has already been neatly established by interview selections and placement of archival material: "Count Basie's status as a great musician is based not on his extension and elaboration of particulars, as is the case of Duke Ellington and Louis Armstrong. His status is based on the refinement of the particulars that made blues music swing." 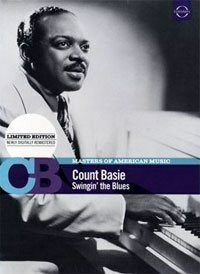 Count Basie – Swinging The Blues manages to both show and tell what refinement means in this context, and that too is some doing. This may be the best of the Masters of American Music series and should be considered highly recommended for all music lovers.